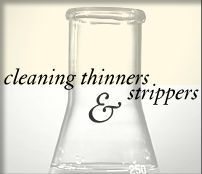 Cleaning Thinners and Strippers: G.J. Nikolas & Co., Inc. Cleaning thinners and strippers are used to remove coatings. Cleaning thinners dissolve reversible coatings like our #8321 and #2105 Lacquers. Strippers are used to lift crosslinked coatings like our #9778 Uralac (Urethane) and #11470 Baked Epoxy. We make several variations of each type to meet the demands of the settings for which they’re used. If you are not sure which product is best for your application please contact us for a recommendation.